ALBUQUERQUE, NM – Two prominent Albuquerque physicians, Dr. Katherine Morris and Dr. Aroop Mangalik, the national nonprofit Compassion & Choices and the American Civil Liberties Union (ACLU) of New Mexico filed a lawsuit today to clarify the ability of mentally competent, terminally ill patients to obtain aid in dying from their physician if they find their dying process unbearable. The doctors are asking the court to declare that physicians who provide a prescription for medication to a mentally competent terminally ill patient, which the patient could consume to bring about a peaceful death, would not be subject to criminal prosecution under existing New Mexico law, which makes a crime of assisting another to ‘commit suicide.’ The choice of a dying patient for a peaceful death is no kind of ‘suicide,’ the physicians’ lawsuit asserts, and the physician does not assist such a patient in ‘committing suicide.’ Laura Schauer Ives, managing attorney for the ACLU of New Mexico, and Compassion & Choices Director of Legal Services Kathryn Tucker represent the physicians. The lawsuit was filed in the Second Judicial District Court. The legal complaint may be viewed here: Morris v. New Mexico (Amended). 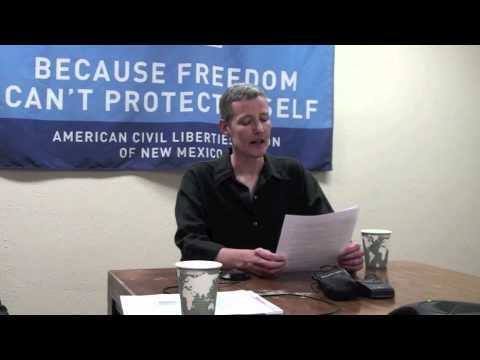 UPDATE: Santa Fe resident and cancer patient Aja Riggs joins lawsuit as plaintiff.